ACT [V] Limit Break 5 (This ability is active if you have five or more damage): [Counterblast (3)] Choose up to 5 of your <<Gold Paladin>> rearguards, and for this turn they receive Power +5000. CONT [V] If you have a "Incandescent Lion, Blond Ezel" in your soul, this unit gets Power +2000. Auto [V] Limit Break 4 (This ability is active if you have four or more damage): [Counterblast (3)] For this turn, this unit gets Power +3000, you may call from your deck up to 2 "Covert Demon Dragon, Magatsu Storm" to R, shuffle that deck, then at the end of the turn move any units called in this way to the bottom of your deck, in any order. 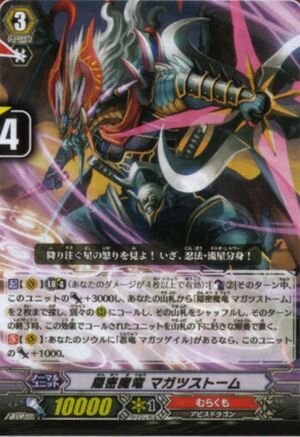 Continuous [V]: If you have a card named "Stealth Dragon, Magatsu Gale" in your soul, this unit gets Power +1000. 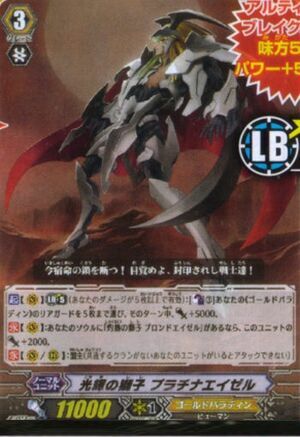 Continuous [V] If you have a card named "Stealth Dragon, Magatsu Wind" in your soul, this unit gets Power +1000. Auto: When a card named "Stealth Dragon, Magatsu Gale" rides this unit, and you have a card named "Stealth Dragon, Magatsu Wind" in your soul, you may call up to two "Stealth Dragon, Magatsu Gale" from your deck to separate R, shuffle that deck, then at the end of the turn move nay units called in this way to the bottom of your deck, in any order. Auto: When a card named "Stealth Dragon, Magatsu Gale" rides this unit, look at up to seven cards from the top of your deck, search for up to one "Cover Demon Dragon, Magatsu Storm" or "Stealth Dragon, Magatsu Gale" from among them, reveal it to your opponent and shuffle your deck. Auto: When a <<Murakumo>> other than "Stealth Dragon, Magatsu Breath" rides this unit, you may call this card to R.
Finally murakumo had received their limit break. Apparent happen to be the last clan to receive it. WHY YU NO GIVE MORE SUPPORT FOR MURAKUMO?